Photo by Jennifer Fumiko Cahill Treats for the living and the dead. When the spirits of the departed return, you don't offer them just anything. 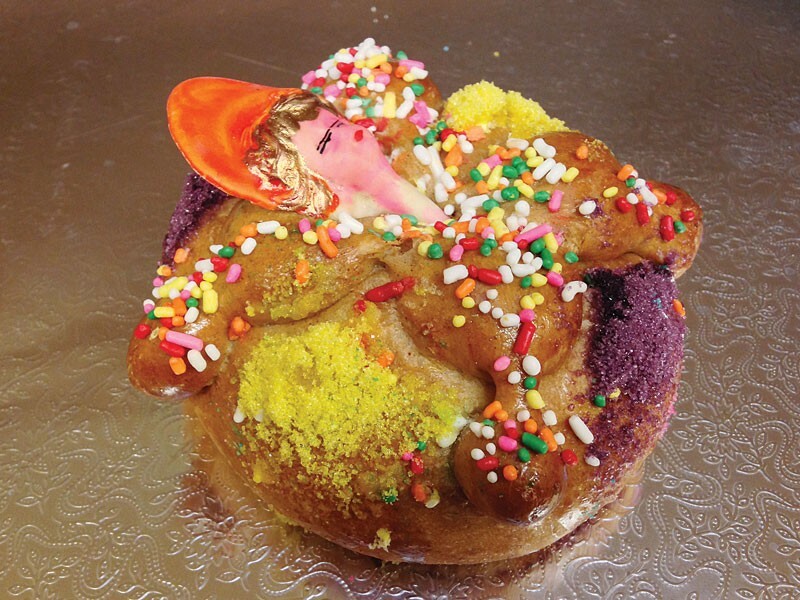 Sweet, colorful pan de muerto, or bread of the dead, only shows up on altars and tables during the Mexican Day of the Dead celebrations on Nov. 1 and 2. Have you been under a rock? Or on the East Coast? If so, here's the gist: El Dia de los Muertos is a time for family and friends to gather and honor loved ones who've passed on with flowers, food, candles, photographs and decorations on an ofrenda, an altar to the dead. And to feast, of course. Los Bagels, with its holiday décor and multi-cultural credo, has become Humboldt's unofficial ambassador for the Day of the Dead, though these days you can't toss a sugar skull without hitting a flier for a related event. You can pick up pan de muerto at local Mexican specialty markets or at Los Bagels, where the house recipe is firm, not too sweet, full of cinnamon and, well, a little bagel-y. If you're ready to roll up your sleeves and roll out some pan de muerto, try it at home with the shop's recipe. Pour the water into the bowl of a mixer. Dissolve the yeast and set aside for 5 minutes before adding the remaining ingredients, reserving one egg for the egg wash. Mix on low speed with the paddle attachment until the dough is smooth, then switch to the dough hook and increase to medium speed for 5 to 8 minutes. The dough will be tacky, but smooth and elastic. Remove the dough from the bowl and place it on a lightly floured surface to rest, covered, for 10 minutes. Uncover and cut the dough into 12 equal portions. Roll these out into rounds, then cut a thumb-sized piece from each round. Cut these pieces in half and roll them back and forth against the counter with three fingers to form lumpy bone shapes about 4 inches long. Cross two bones over each round, pressing the ends into each one's base. Place the rounds on 2 parchment-lined baking sheets, 6 rounds per sheet. Place the sheets somewhere warm to rise for about 2 hours, until the balls of dough have doubled in size. Preheat the oven to 350 F. Beat the reserved egg and brush the rounds with it. Decorate the buns with the colored sugar and decorations and bake them for 20 to 25 minutes.